Find the hidden treasure of Dresan Keep. "I was charged with protecting our greatest treasure — the combined histories of the earliest days of High Rock." 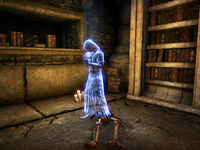 I encountered the spirit of Richard Dusant, who died searching for the hidden treasure of Dresan Keep. He wants me to finish his search for the Keep's ancient secrets. Go down the old well. The spirit tells you he was a famous adventurer and treasure hunter before the cultists killed him. He was looking for the renowned treasure of the Keep and now he asks for help to finish the quest for him. There are three statues around the ruin called the Heralds. Take the offerings brought in the backpack and present them to the proper Herald. That should open a passage under the well. Each Herald offer a riddle, matching the right offering from the backpack on each statue will ensure the opening of the passage. Take Richard's backpack and head up to the keep to find the three statues. Beware of the Bloodthorn cultists surrounding the area. Start with The Herald of Thirst, whose riddle reads: The Demon of Knowledge bestowed a great thirst for knowing the unknown and recording the unrecorded. We remember this thirst with a Vessel which begins empty and must be filled with knowledge. Present the old cup as an offering. The Herald of Memory's riddle is: History outlasts flesh. The mountain crumbles and the lake dries, but the map remembers. All history is contained in the Tome. Yet the Tome contains only truth, for that is what will endure. Place the Chronicle of Deleyn dynasty as an offering. The Herald of Illumination's riddle is: Knowledge is light. It is the light of the candle on the Book's page and the illumination gained through study. We seek enlightenment against the shadow of ignorance and the darkness of despair. Place the Candle as an offering. Grab the skyshard next to it. If you place the wrong offering at any of the statues, the Price of Ignorance will appear and attack you. After making the offerings follow the marker to find the Old Well. The passage should be open now. Jump down the well and search the underground vault. In one of the rooms you will find another spirit, go forward and talk to it. He is the Keeper of Knowledge and he asks what they are doing here. In the library, the spirit tells you he is the High Librarian of Dresan Keep and charged with protecting the great treasure, the combined histories of the earliest days of High Rock. Their patron is Hermaeus Mora, the scryer of the heavens and he who determines the Tides of Fate. These treasures have been sealed away far too long. Hoarding knowledge is worse than hoarding gold, or so our patron has decreed. Here is the Dresan Index with names of all the volumes and scrolls the keep contains and give it to someone who can make use of it, such as a scholar of magic. Leave the vault through the now unsealed door and return to Richard Dusant. He is really disappointed that there was no fabulous treasure of jewels or gold and that he died for a bunch of moldy old books. A cruel fate and he wishes he had a book before all this that would have told him what was in this stupid old keep.